If you haven't read The Penguins Need to Deal Despres please do. Thank you for all the comments and lively debate on my “The Penguins Need to Deal Despres”. Let me clear something up; I am a Despres fan. Note that I predicted he will be a good D man. 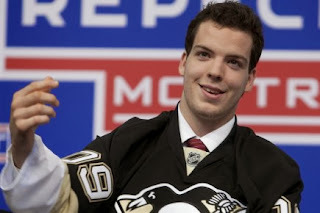 Pens’ fans have a bad habit of falling in love with the guys who we draft/bring up from WBS. Much like that person who stole your virginity, they won’t be around forever. I offer the example of Ben Lovejoy. Who didn’t love Benny, especially after 24/7? He was so proud of those sutures in his cheek. When Shero traded him I was shocked and a little upset. Looking back, it was the best gift he could have given Lovejoy. In Pittsburgh, he was scratched more times than a hound dog with fleas. The Ducks love him. They have embraced him and he is thriving. I agree with all who speculated that Winnipeg is a good place to go shopping. I further agree, Despres won’t be the only element in the potential trade in order to get a high return…..although, remember that time Shero traded Goligoski? I love Despres. It is awful to see him scratched night after night. Indeed, #freedespres may just mean sending him somewhere to fly, because as a Penguin, he's not. Feel that age will eventually push Orpik and Martin down or out, but Despres is ready now. Let him play or let him go.